VCOSS has developed this free online tool to assess your organisation’s governance. All Board/Committee members need to do is answer a series of questions, either as individuals or as part of a group. You will then be presented with tailored tips and recommendations to improve organisational governance. There is a pervasive fear in the nonprofit field that focusing inwardly—on our staff, our leadership, even our own salaries—will take away from achieving our organizational missions. That needs to change. Bright-eyed and bushy-tailed, you jump on board, heart open, mind and body ready to work tirelessly to “fulfill the mission.” Then, the creep happens: The hours are long; the pay is mediocre; the leadership is not as tuned-in as you’d hoped; the career ladder seems non-existent. In fact, you feel like the organization expects you won’t last. We are creative. We have public support. And – most importantly – we have people power. We have volunteers and members who give their time and money and work with us to improve transit in Toronto. 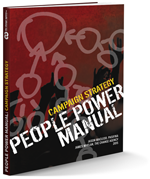 To build our people power and win our campaigns we must build leaders out of our supporters. Jessica Bell shares three tips on what she does to build leaders in her group. An article by Jo Freeman first written in the 1970s articulates insights into grassroots dynamics and politics surrounding orgamisational structure(s). Freeman highlights the inequitable power issues in so-called structurelessness. An excellent and extensive collection of resources on: planning and acting; getting noticed; evaluating; getting and keeping people; leading; meeting and deciding; facilitating; fundraising; group structure; door-knocking; conflict resolution; listening projects; nonviolent communication; Gandhi’s methods; and strategic thinking.